I've been playing around with Photoshop the last few days and manipulating some images of deep sky objects to appear as they do through my 10" Zhumell dob. 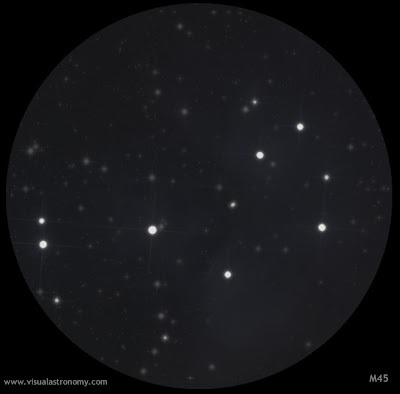 This first "Photoshop sketch" is of M45, and reflects how I see M45 from Ashtabula, OH. I can just barely start to see a hint of the nebulosity, as shown in this "sketch". This sketch was made by taking an image of M45 (for example, a Hubble photo), then manipulating the image's contrast, saturation, and several other tricks to produce an image like one through an amateur telescope. I plan on doing more of these (since I'm horrible at sketching astronomical objects by hand), so stay tuned! Intriguing idea. Sketches are almost always best at describing the view through a small-medium size telescope. Good report. Rather appealing to read the paper. I absolutely love to look over an extremely fine report. Now click here check cashing places near me Always keep rocking.